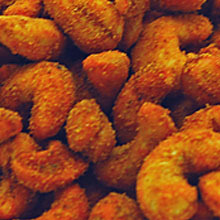 Creamy cashews seasoned with a Cajun kick! Now you can get your spicy fix in the healthy form of cashews. These dry-roasted cashews are tossed in a fiery blend of spices like cayenne and habanero. They’re cashews with a kick! Price quoted is per pound, not including shipping.